Stems: Solitary, erect to ascending, unbranched below inflorescence, hirsute to villous. Leaves: Basal and carline. Basal lives present at flowering, sessile or short-petiolate; blade oblanceolate to broadly obovate, .8 to 5.2 inches long, .25 to 2 inches wide, base usually long tapering, margins entire or bluntly toothed or scalloped, tip rounded, surfaces and margins moderately to densely pubescent. Cauline leaves few, gradually reduced above; blade sessile, lanceolate to oblong or ovate, .4 to 2.8 inches, base clasping or slightly auriculate, margins usually toothed or rarely lowermost with a few teeth near the apex, margins ciliate, surfaces moderately hirsute, apex often tapered to sharp point. Inflorescences: Solitary heads or 2-5 heads in flat-topped panicles, radiate. Involucres turbinate to hemispheric, .2 to .28 inch tall, .24 to .8 inch wide. Phyllaries in 2-3(-4) series, sparsely to moderately hirsute, often also minutely glandular. Receptacle .5 to .8 inch diameter. 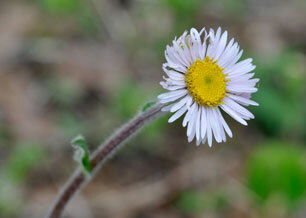 Flowers: Ray florets 50-80(-100), corollas pale blue to pinkish, .24 to .4 inch long. Disc florets numerous, corollas yellow, .18 to .24 inch lobes 5. Fruits: Achenes, tan, oblong, .05 to .08 inch, 2-nerved, surfaces glabrous to glabrate; papas with inner series of 22-36 threadlike bristles and often an outer series of a few shorter bristles. Comments: Robin's plantain is rhizomatous and often occurs in colonies.